ADVA Optical Networking is a global supplier of smart solutions for telecommunication market. The company focuses on developing solutions for the Optical & Ethernet segments (both for Telecom & enterprise industry) paying special attention to automation, scalability, cost-effectiveness, software’s functionality, system management and reliability. ADVA Optical Networking is listed on the German stock exchange in Frankfurt. The headquarter is located in Munich, whereas main manufacturing plant in Meiningen, close to Frankfurt. As the global supplier, ADVA Optical Networking has several R&D Departments located around the world, including USA (Richardson, Washington D.C and Norcross), Shenzhen (China), Oslo (Norway) or even Israel. Therefore, a big branch (approx. 200 employees) is located in Gdańsk in Poland. Total number of employees exceeds 1 400 people and income is around 340 mln EUR. ADVA Optical Networks has two main product platforms, FSP3000 and FSP150, in its portfolio. The first platform FSP3000 is primarily a scalable (from metro networks to the long-distance network) DWDM transport platform, which has all of the functionalities of the photonic layer, as one would expect in a modern equipment of this class (such as OTN transmission, ROADM optical switching with colorless, directionless and contentionless functionalities, 40G and 100G transponders and muxponders , including 100G coherent solution to combine long-distance and low-cost solutions for 100G metro links, EDFA and RAMAN optical amplifiers or the ability to transmit 96 DWDM channels), supported by unique functionalities concerning software and management system (GMPLS, regeneration in the optical layer, service manager). 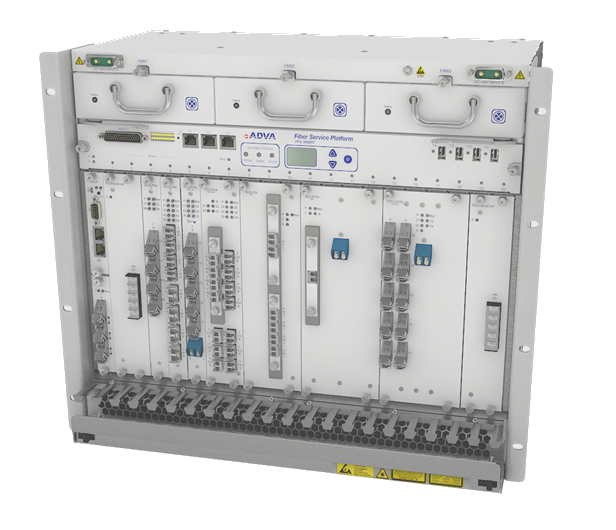 FSP150 is a family of Carrier Ethernet products, supporting full synchronization in Ethernet layer (also with the Syncjack a unique solution), demarcation, management, administration, provisioning (OAM & P) and protection (ERPS). FSP150 devices are used for demarcation and aggregation and mobile backhaul applications (3G and 4G). At present, approx. 70% of the company's revenue is generated by the Telecom industry, while the remaining 30% by the Enterprise market. ADVA is the world leader in the field of fiber access network for the Ethernet (Ethernet Access Devices), with a market share exceeding 20%. The company is also the market leader in WDM metro equipment in Europe. Software and management system (control plane, service manager at SDN) are considered as one of the best and most advanced solutions. Additionally, a strong position of ADVA is the result of unique characteristics as e.g. one of the lowest latency available in the market, AES hardware encryption,16G FC support (ADVA as the first received certification for its solutions, Brocade 16G FC). Therefore, the company cooperates closely with all the leading worldwide suppliers of IT solutions for SANs, as it can be clearly seen by the fact that ADVA's products are certified and qualified, among others, by Brocade, IBM, Juniper, HP, Sun, Hitachi, Fujitsu or NEC. All ADVA Optical Networking products are available in Poland via ELMAT, please contact us!